The story of George Lowe is uplifting, in ways. He was a journeyman in the early years of the expansion of golf, and a gifted clubmaker. And unlike many of his ilk, Lowe was recognized fairly generously for his craft. 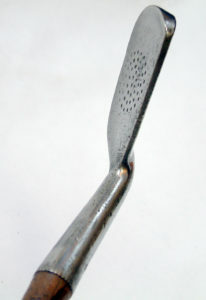 This anti-shank mashie is marked with the common J.H. Hawkins’ “never rust” stampings, probably from the early 1900s. I find that, with the advanced position of the leading edge, one can produce a reliable and low-boring draw with this club using a stringer-type swing, probably a terrific shot in windy conditions on any links course. The look of the club at address if off-putting, but if one can ignore the visuals, the results are perfectly good and predictable. This club has a skinny, old grip on it. I feel I would do better with it with an extra layer or two under hand – something I can address if I elect to play with this one. By the way, I paid $12.77 for this club on eBay on 4/2/17. Lowe’s patents were the first to cover the concept of a matched set of irons and at the time, many irons were purchased as a set. Born at Carmyle near Carnoustie in 1856, Lowe apprenticed under both Frank Bell and Tom Morris and worked as an assistant to Jack Morris at Liverpool (Hoylake). Lowe served as the head professional at Royal Lytham and St. Anne’s-on-the-Sea beginning in 1888 (for which this club carries its mark) and was also a prominent golf course architect, designing more than 120 courses. The name George Lowe is not one that features prominently in golfing circles, and yet he had a significant input in the local golf scene and the Queenscliff community. Born George Low in 1856 at Carmylie, a small hamlet not far from Carnoustie, Dundee and St. Andrews, he moved to Carnoustie with his family when eight years of age, and fell under the spell of the game of golf. When in his teens he and his brothers moved south–all the way to England. According to Bernard Darwin in his book “A history of Golf In Britain; there was a lot of proper respect for Scotland because in the mid-80’s practically all professionals were from that country. In 1876, George made a break from his family and moved to Hoylake and was apprenticed as a club maker and assistant professional to Jack Morris, nephew of the legendary Tom Morris the senior professional at St. Andrews. His brother David moved to Blundellsands club in Lancashire where he remained as professional for 40 years. Another brother, William, was the first to migrate to Australia, but could not settle, and soon returned to England where he became professional at Buxton in Derbyshire. When the three brothers ventured south to England they all changed their name to Lowe (possibly the English version of the name). The fourth brother James retained the original name and remained in Scotland, and his son David, having for a time been apprenticed to George at Lytham St. Annes, returned to Scotland where he became involved in establishing a huge golf and ski equipment business. The business branched out to Carnoustie and St. Andrews and included the Argyle works in St. Andrews, the manufacturer of wooden “Golf Classic” putters as well as other antique clubs. 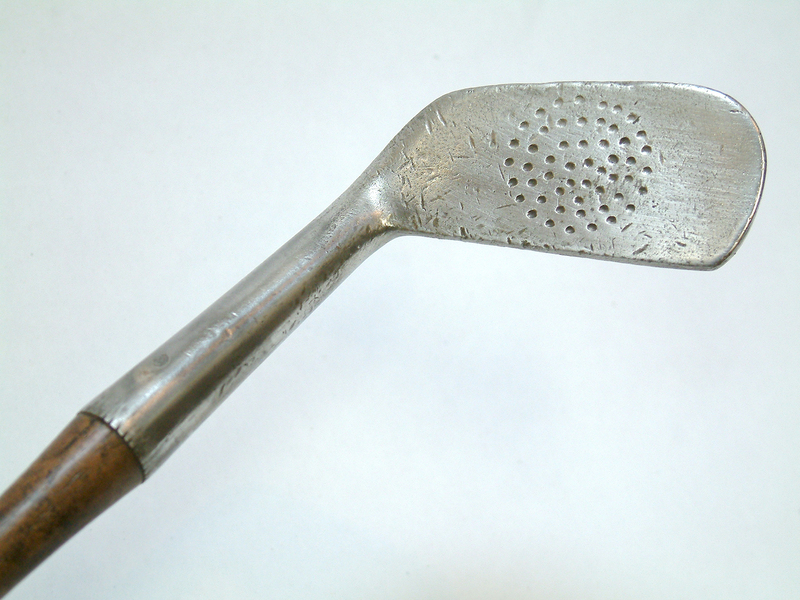 George Lowe was obviously a man of vision, and experimented with club design, resulting in many patents being applied for. Stewart Lowe displayed in his pro shop George’s US patent for 25.000 iron clubs. 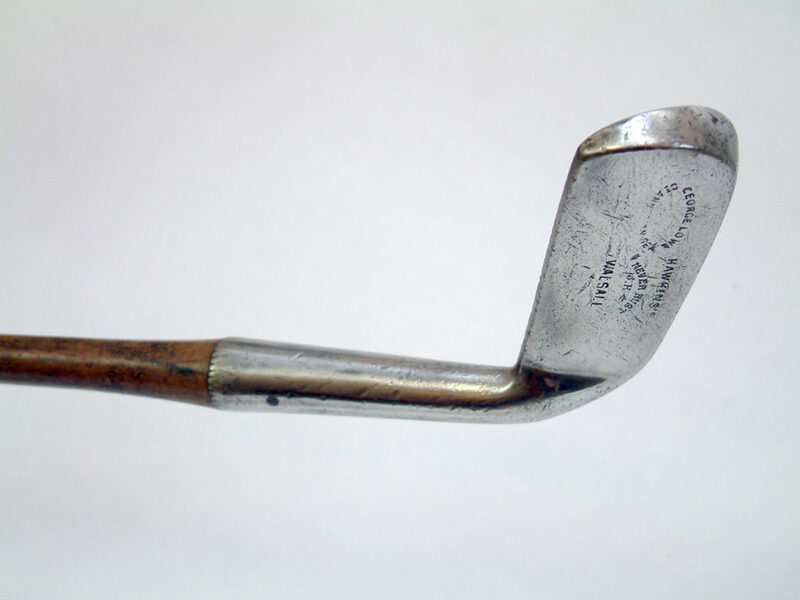 Among George’s earliest ideas was for a matched set of iron clubs, and his patent was for iron clubs 3 inches by 1-3/8 inches by 5/8 inches across the sole, naming the clubs ordinary irons, lofting irons or mashies and the face being flat all through. Amy Peel Marsden, George’s second daughter often criticised her father for not patenting in his own name many of his ideas, one of which was the use of steel shafts instead of the hickory ones in vogue, and it appears that he had some input into their development, but that is refuted by members of the family as George was a shrewd businessman with vision, so it would seem that had it been possible then he certainly would have. Stewart believes that his father was the first person to use a light canvas bag, it was the vogue for players to carry a couple of clubs loosely in the hands, or at best kept together with a strap, and as more clubs were thought necessary a bag became essential. Again George did not apply for a patent, perhaps someone else beat him to it! When he served notice at Hoylake in 1888 all efforts were made to keep him there, but he was of the opinion that his future lay at St. Annes where he took up duties on July 2, 1888. While at Hoylake, George married and his wife, Annie Allen, a farmer’s daughter from Western Ireland, bore him four sons–Alexander (known as Stewart), George Jun, Ramsay (Allan) and Robert (Ivan), and two daughters Annie and Amy Peel. George and Allan followed their father into the world of professional golf. George Sr., as professional and greenkeeper of Lytham and St. Annes obviously had a lot to do with the layout, as five years after being a “terra incognita” to golfers, Lowe organised a tournament “for all the well known cracks” with a purse of 53 pounds over a course of approximately 3-1/4 miles. The winner of the event was Willie Fernie of Troon, whose son Tom became professional at Royal Lytham and St. Annes in 1926 where he served until 1951 (the Royal prefix was granted that same year). George Sr. was just below the “top notchers” as a player but is still credited with six First Professional prizes, but he was famous as a course architect in company with three others (W. H. Fowler, Harry Colt and Tom Simpson) for 120 courses in England and Europe (including the original Lytham and St. Annes course. It was at Royal Lytham and St. Annes that Bobby Jones was immortalized by coming from two shots behind Al Watrous to win the 1926 Open Championship, playing a mashie over 170 yards out of a bunker to the 17th green, the spot marked by a plaque to this day. George’s wife Annie died in April 1919 and two of his sons, Allan and Ivan migrated to Australia, joining their brother George Jr., then George and his eldest daughter Annie, followed in 1920, and settled in Queenscliff, taking up residence at 64 Learmonth Street, to be near George Jr., who had established himself as the professional at the Barwon Heads Golf Club. The Barwon Heads Golf Club was then located at the Sheepwash. George Sr. brought with him the values, principles and characteristics for which the Scots are known and was soon involved with community matters. He married Isabella Lane when he was 67; became Master of the Masonic Lodge No. 96, was appointed a Justice of the Peace in June 1923; took up bowls and won the championship at Queenscliff in 1926-27; and in his retirement took up growing vegetables and breeding golden Lebright bantams. But golf was his first love, and he was appointed the professional at Queenscliff Golf Club on the 11th of October 1921. After he resigned his position at the club, he continued to teach all those interested in the sport on a flat piece of land which became known as Scotsman’s Flat. George Lowe senior died on the 15th of October, 1934, aged 78 years.